Vasiliy Ganotskiy is a master of portrait-painting and narrative picture. His works are devoted to various genres. In the still lifes the artist develops the idea of natural beauty, the broad palette of feelings is reflecting, they all are different by personality and a wealth of beautiful forms. In his landscapes the artist shows a great love of his native land. However, the main thing in the work of Ganotskiy was a portrait, the artist is a recognized master of portrait painting. The exhibition shows a series of images of historical figures and well-known contemporaries. 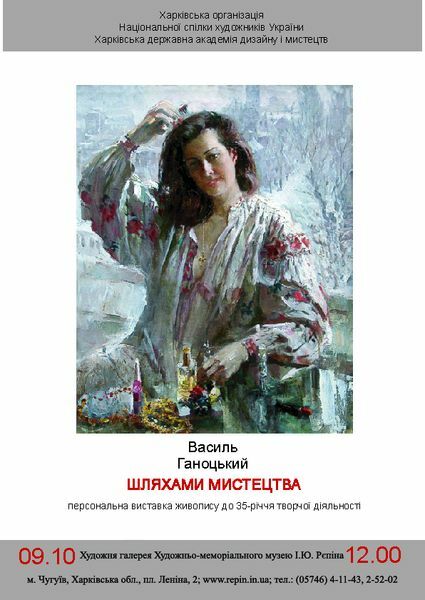 Vasiliy Ganotskiy - People's Artist of Ukraine, member of the National Union of Artists of Ukraine, Honored Artist of Ukraine, the famous master of portraiture, landscape and still life. Born in October 5, 1951 in the village of Suvorovo, Crimea. From 1974 to 1979 he studied at the Kharkov Art and Industrial Institute. Since 1980 he was actively participated in all Union, republican and regional exhibitions. The artist's works are represented in museums, galleries and private collections in Ukraine and abroad.